Just off the coast of Florida, St. George Island in Franklin County lies between the Gulf of Mexico and Apalachicola Bay. Just one mile wide at its widest point, it is 28 miles long and is roughly divided into three separate areas, each with their own special attractions. 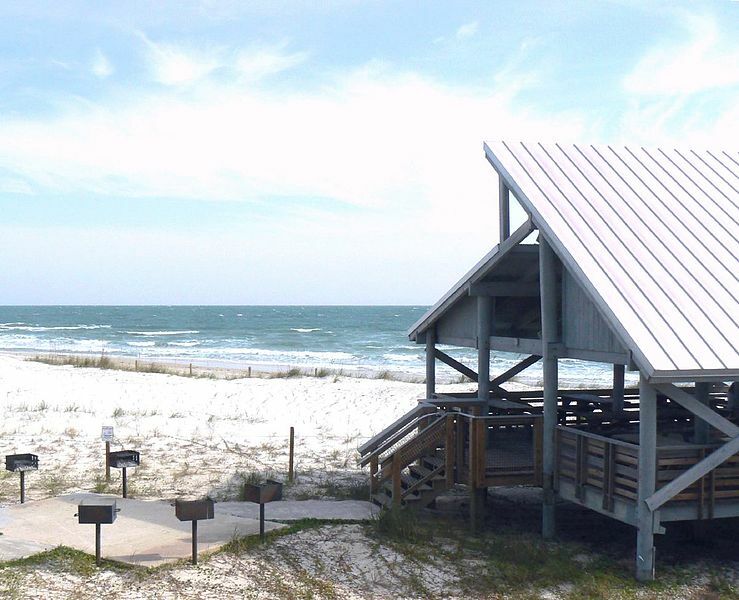 The Dr. Julian G. Bruce St. George Island State Park is at the eastern end and covers approximately nine miles. Then there is a public strip of bars, restaurants, beaches, homes and small businesses. At the western end of the island is a highly exclusive, gated community, sometimes known as St. George’s Plantation. It occupies some 1,200 acres and has its own airstrip, plus 24/7 security to exclude all but residents or rental occupiers from some of the most high-priced multi-million dollar beach homes that exist along the Gulf of Mexico. Visitors who pick up cheap rental cars and drive over from Eastpoint on the mainland via the St. George Island Bridge are treated to a wonderful four-mile drive across the sea on Florida’s third longest bridge, skirting a small island on the way. On St. George Island the bridge ends close to St. George Island Lighthouse, the views from which are superb. There’s a small but fascinating museum attached to the lighthouse, which tells the story of how the 1852 lighthouse was destroyed and then rebuilt using original materials and plans. This fabulous park is in a perfect setting featuring miles of unspoiled sandy beaches and sparkling emerald waters. There is a wealth of activities available for those who love the outdoor life, including camping and hiking, and nature study in the pristine marshes. Water sports include canoeing and boating as well as swimming. Anglers can fish in Apalachicola Bay for flounder, pompano, redfish, sea trout, Spanish mackerel and whiting, as long as they have a valid saltwater fishing license. The beaches are perfect for sunbathing and shell collecting. A selection of boardwalks and viewing platforms allow visitors to see a variety of birds. The park’s grass flats and sandy shores are often used as nesting places by shore birds, such as Black Skimmer, Least Tern, Western Snowy Plover and Willet. There are six large picnic shelters in the park, equipped with tables, grills and restrooms, and there are full facility campsites that are easy to access. Adventurous folks can opt for a primitive campsite accessible by private boat or a hiking trail. Local shops often sell work created by Franklin County artists – paintings, sketches and crafts, for example. Oysters and scallops are plentiful and restaurants feature many delicious dishes that make the most of the local seafood. Visitors who fly directly to St. George Island can pick up cheap rental cars at St. George Island Airport. Although, driving is not permitted in the dune areas, driving through the park is pure pleasure and speed is restricted to 25 miles per hour. If you or someone you know would like to contribute a guest post to our site, please feel free to email us your idea to pulseofcentralflorida@mail.com.